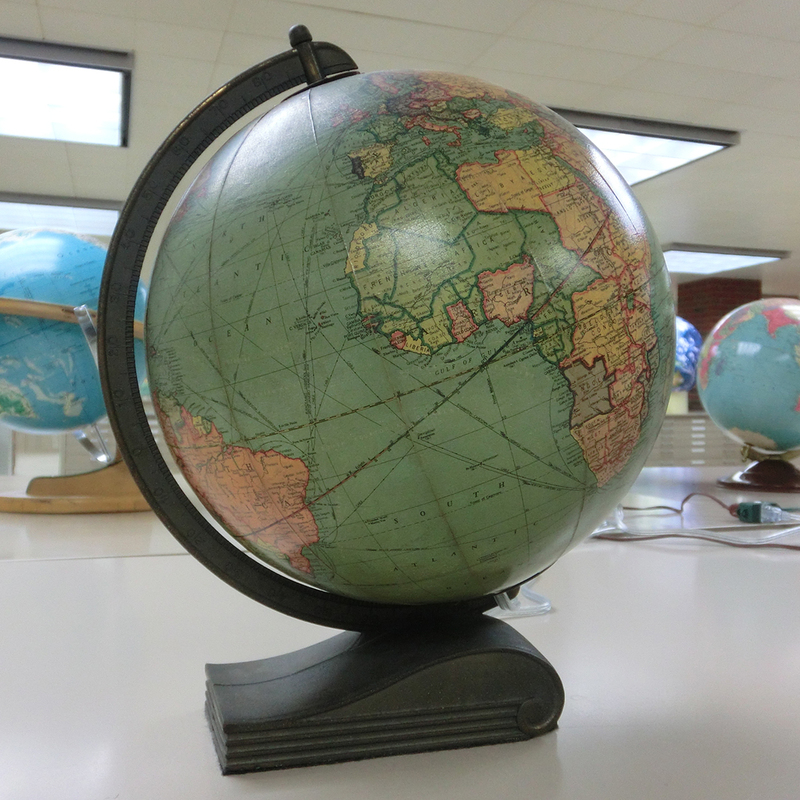 In June, I had the opportunity to visit the University of Wisconsin, to see the globe collection of the American Geographical Society (AGS), in Milwaukee. 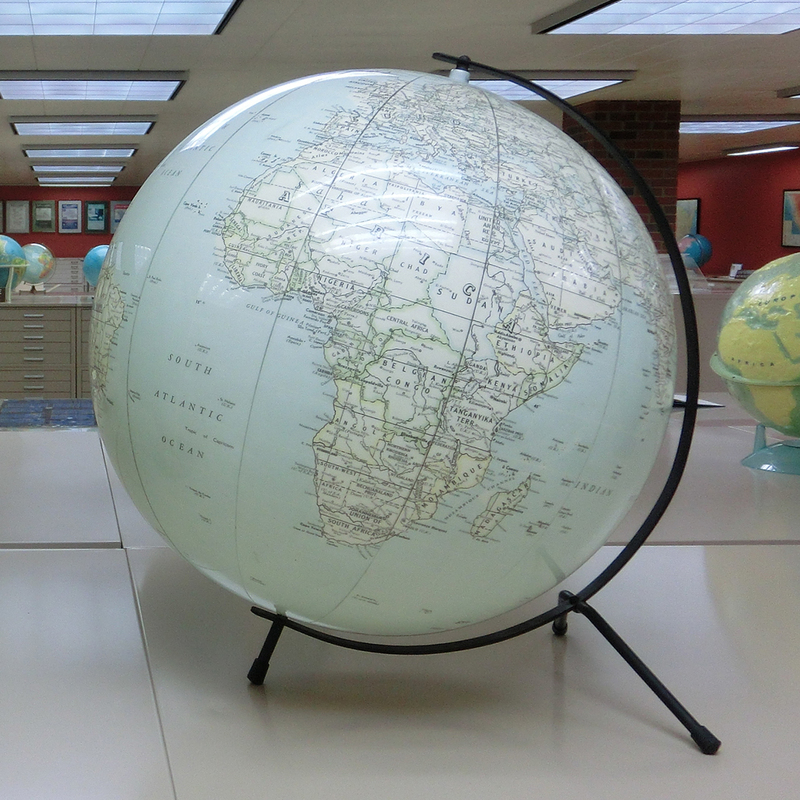 The AGS’s entire collection of globes and maps was sent to Milwaukee in 1978 because it had simply become too costly to house the collection in New York City (think the price of New York real estate). The AGS library takes up half a floor of a modern multistory building on the UWM campus. 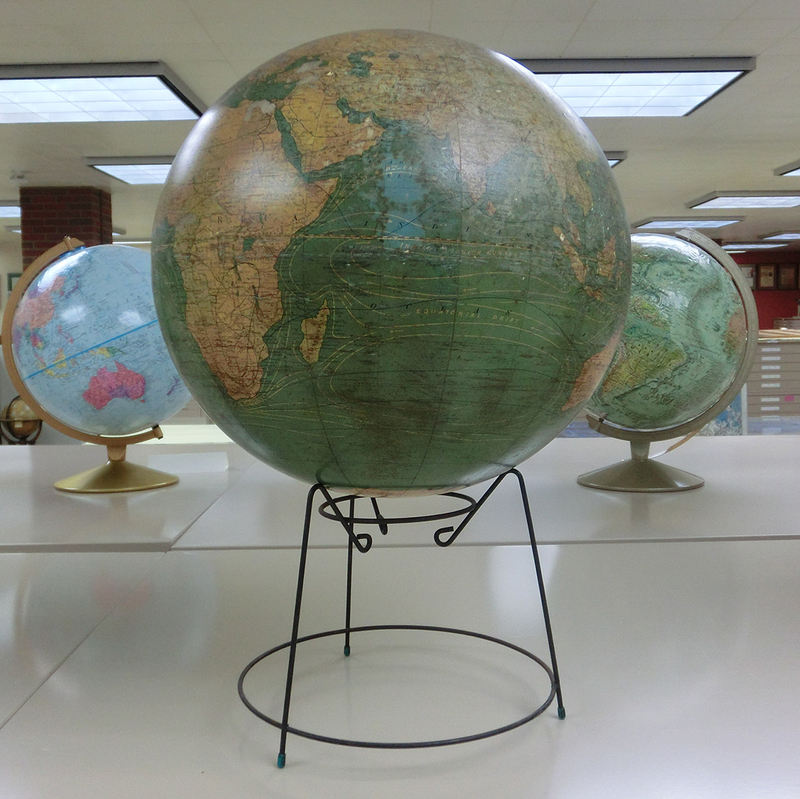 When I entered, the globes were the first thing I saw, all perched on top of filing cabinets (filled with maps!) throughout the library. There are about 100 or so. Most of them are from the 20th century, but some extraordinary ones were much older. 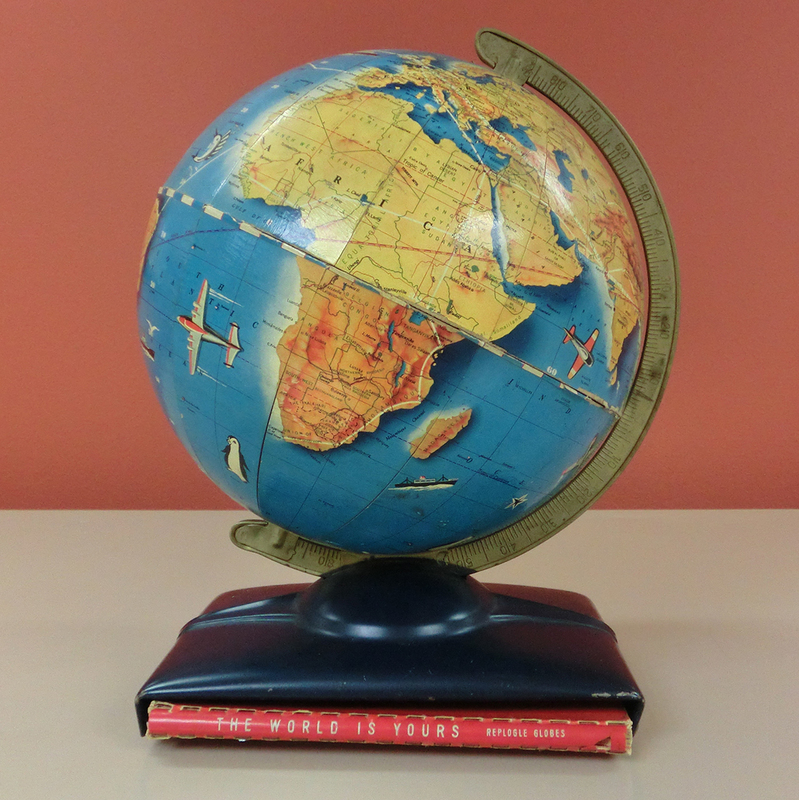 There were globes for everyone, children, adults, and scholars. 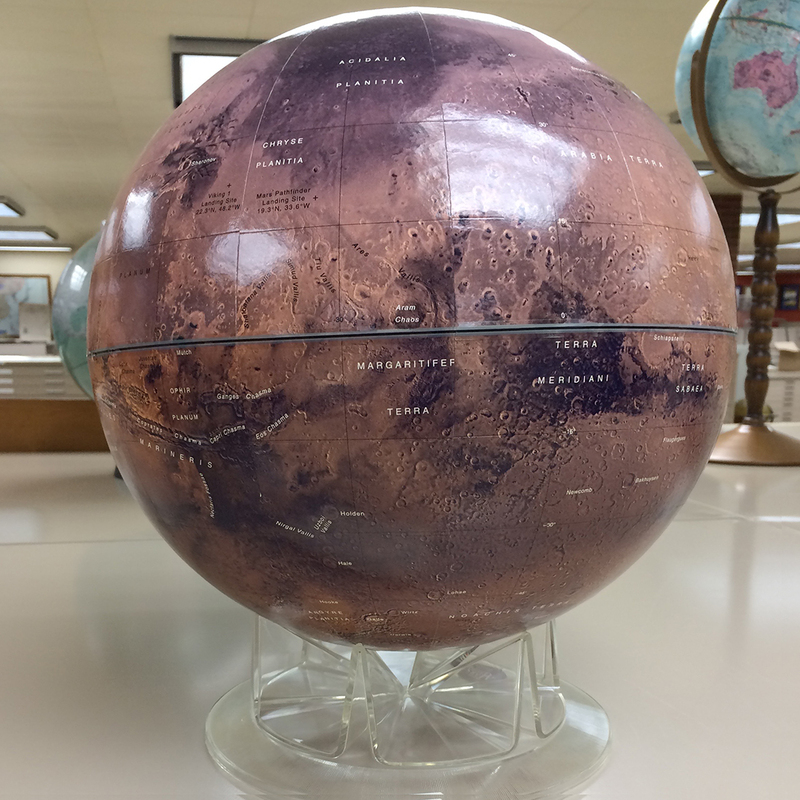 There were globes of earth, the moon, Mars and the stars. They were all different colors. 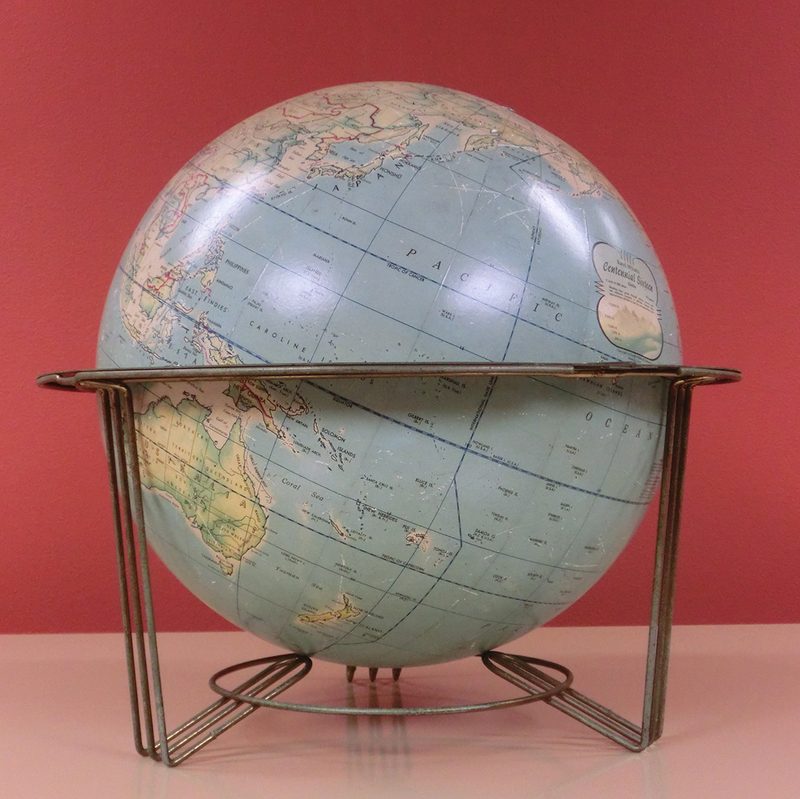 Most of them were round, but not all, like the Buckminster Fuller Dymaxion Map, a large globe made of triangles. 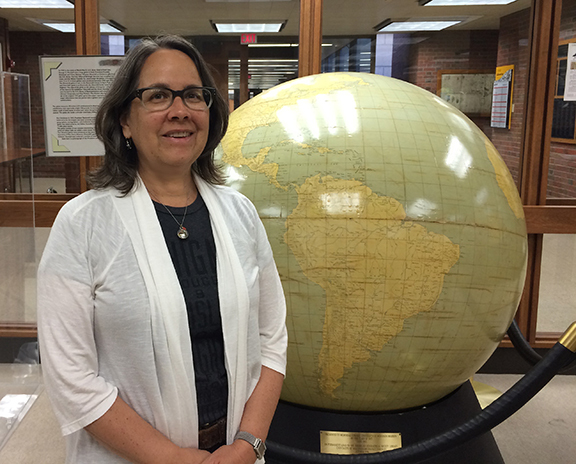 When I arrived, I was met by reference librarian Jovanka Ristic. I had corresponded with her prior to my visit and to her suggestion, I had looked at their digital catalog and chosen several maps that I wanted to see. Jovanka had all of the maps ready for me on one of the large tables. Since this was in the beginning of my research, I chose a somewhat random selection to look at, including military maps printed on silk. These maps were to be carried by soldiers during World War II. The idea was they could be folded and stuffed in a pocket, or sewn into the lining of clothing, to be removed if the airman was able to escape the enemy. Silk would not make noise when unfolded and would not be damaged when wet. One the left is a map by the CIA, on the right is an illustrative map. She pulled more maps for me as she tried to decipher what I was trying to get at by looking at all this. Again, this was one of my first forays into the visual research of maps and I didn’t really know what I was looking for. 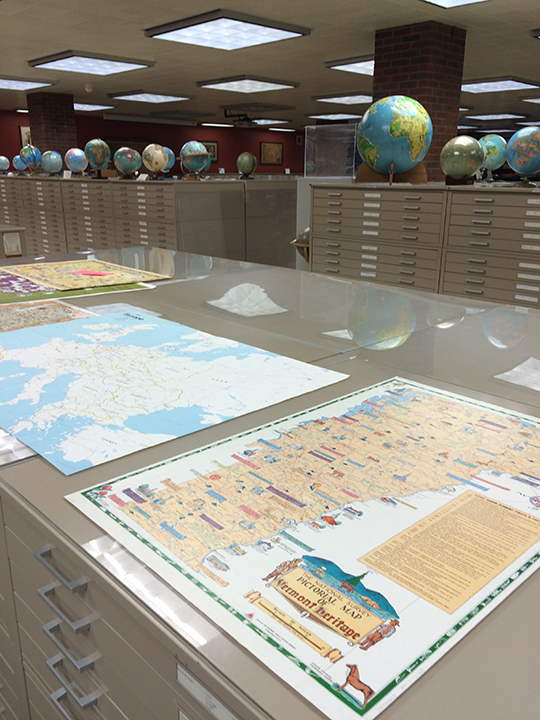 I was fortunate to see so many different styles and maps used for many different purposes all in one visit. I wish I had time to look into each category in more depth. Jovanka also showed me other items from the rare materials room. This included a mappa mundi made by Leardo Giovanni in 1452, forty years before Columbus sailed the ocean blue. 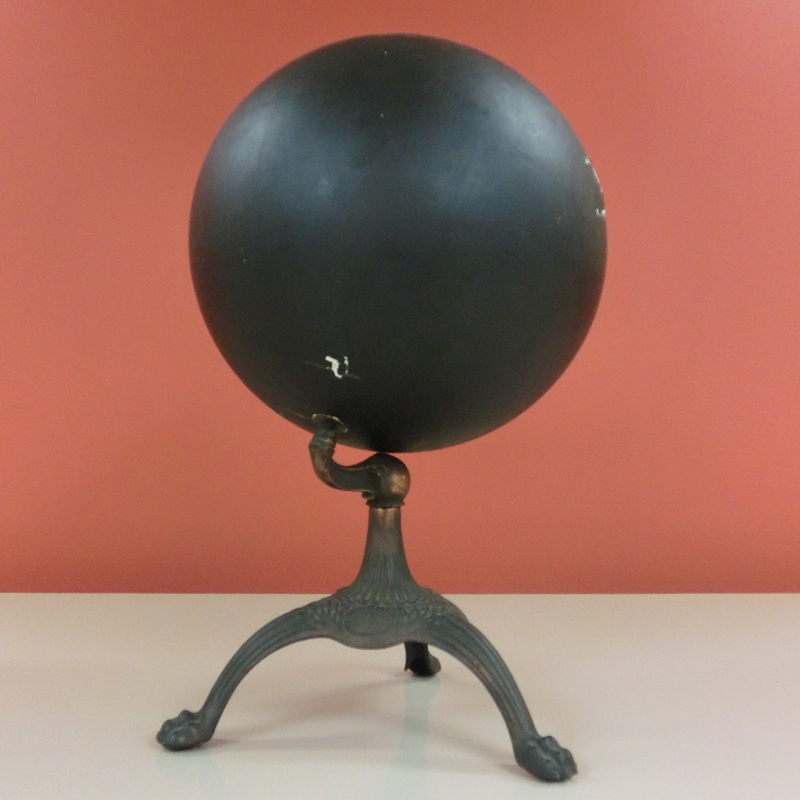 She pulled a beautifully illustrated atlas from about 1700. 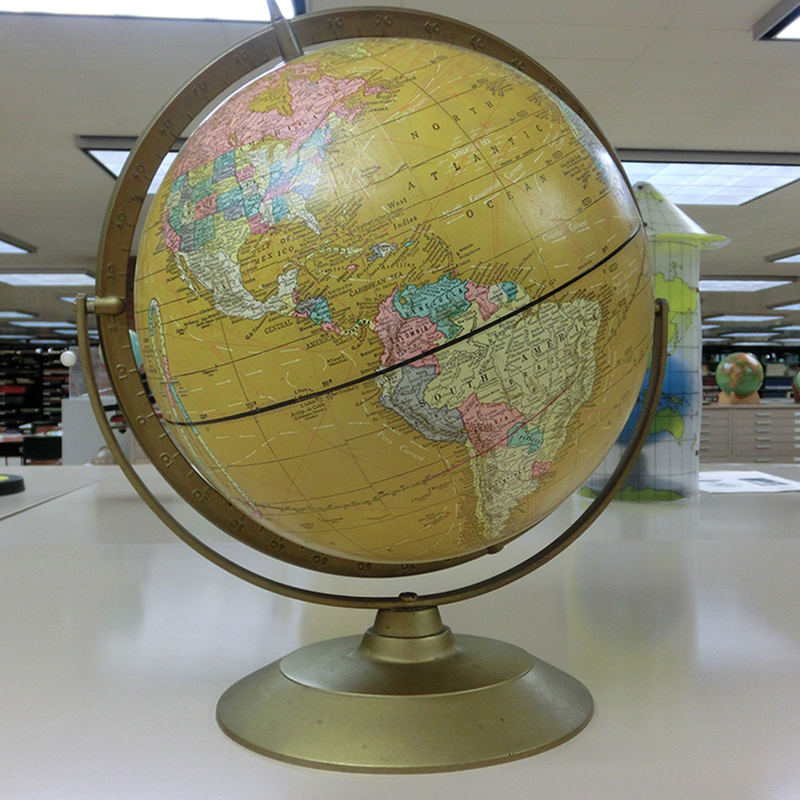 At that time, atlases were all the rage. Every wealthy household needed one. 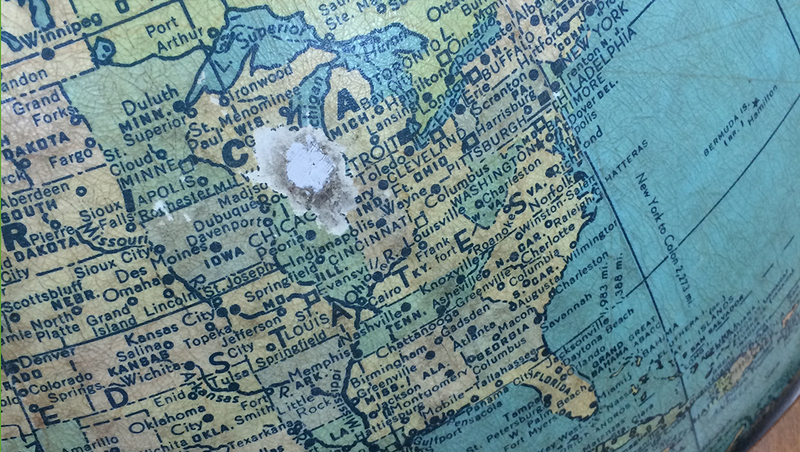 On the walls of the rare materials room hung maps used by Charles Lindbergh to plot his famous flights. 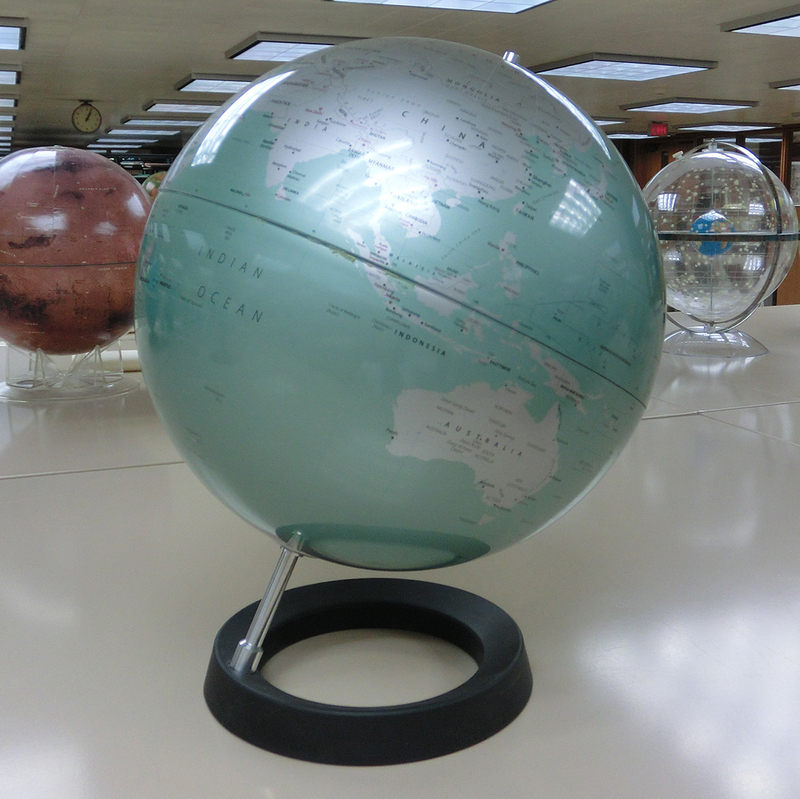 But the globe collection was the highlight. It was eclectic, colorful and three-dimensional. Many were cradled in bases that were designed of their era. Some were sleek and modern or futuristic, others were heavy and substantial. They are all works of art. I spent quite a bit of time photographing them and looking at their detail. There were points during my visit where I could not believe what I was looking at. 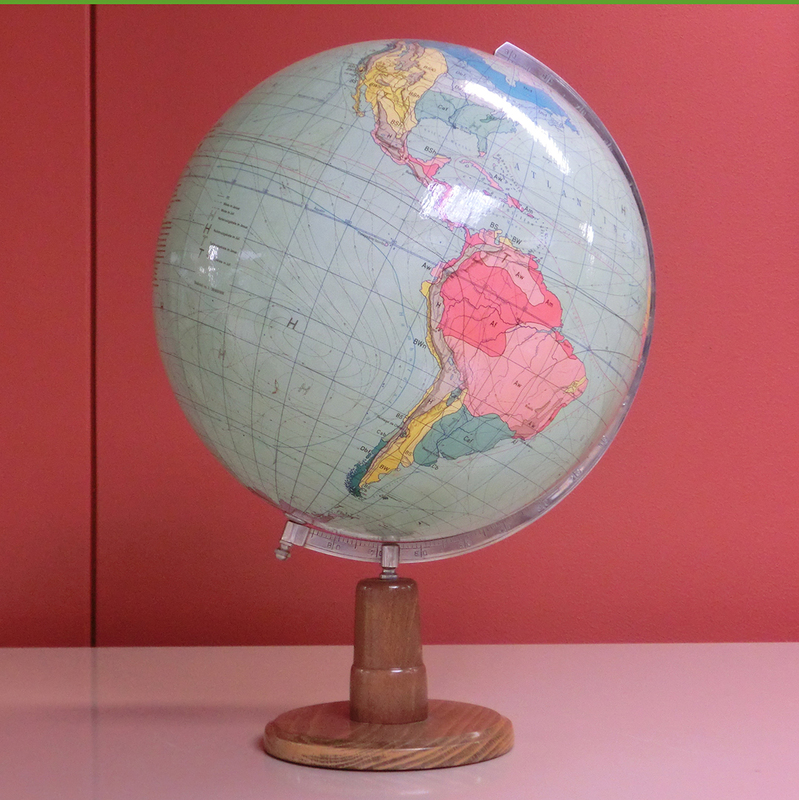 I had read about the Churchill globes in Simon Garfield’s On the Map and here was one of those 5o inch diameter globes right in front of me. 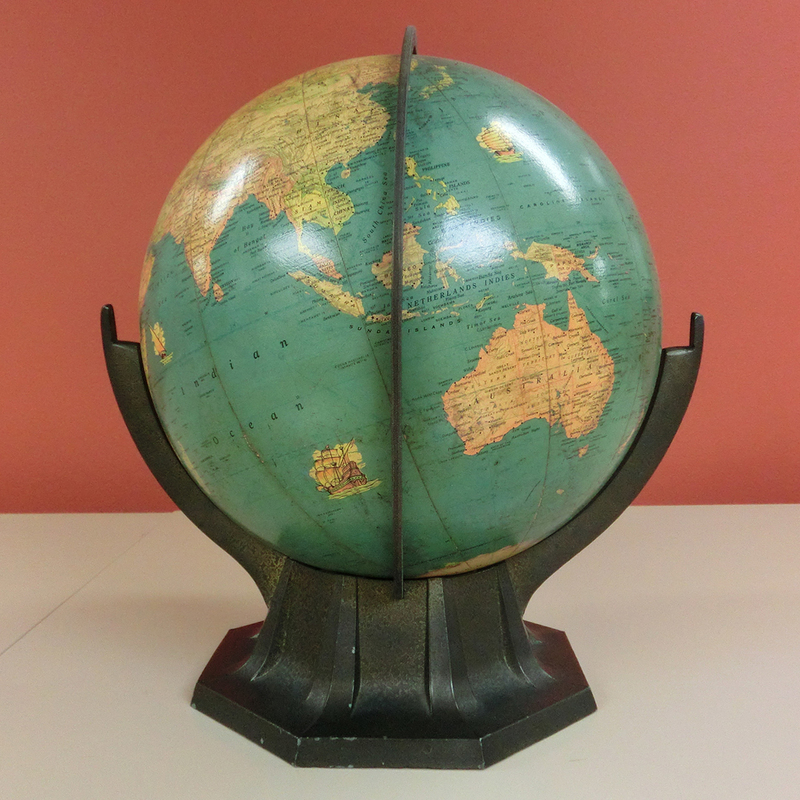 Granted, it was not the actual one that Roosevelt or Churchill used, but it was one of a handful that were made for the men, so when they discussed strategy during World War II, they’d be looking at an identical globe. 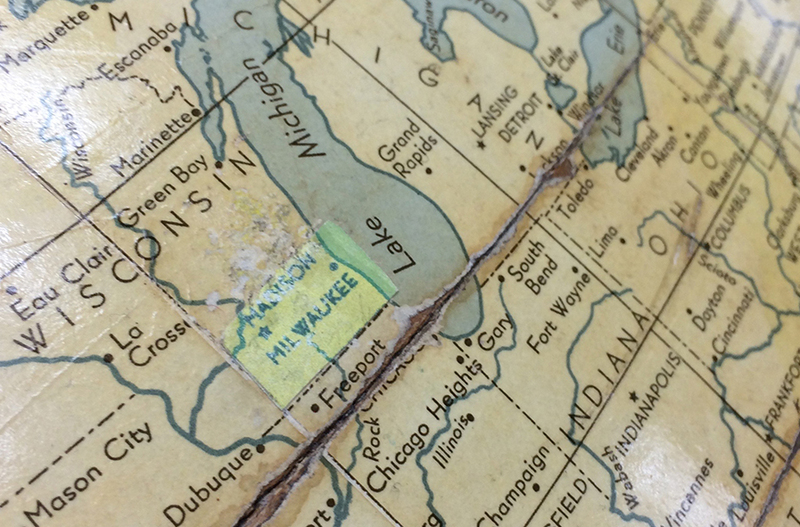 I loved how Milwaukee had been obliterated by everyone touching the city on the globe. During my visit, Jovanka was extremely patient and helpful. Her selections helped me tremendously. 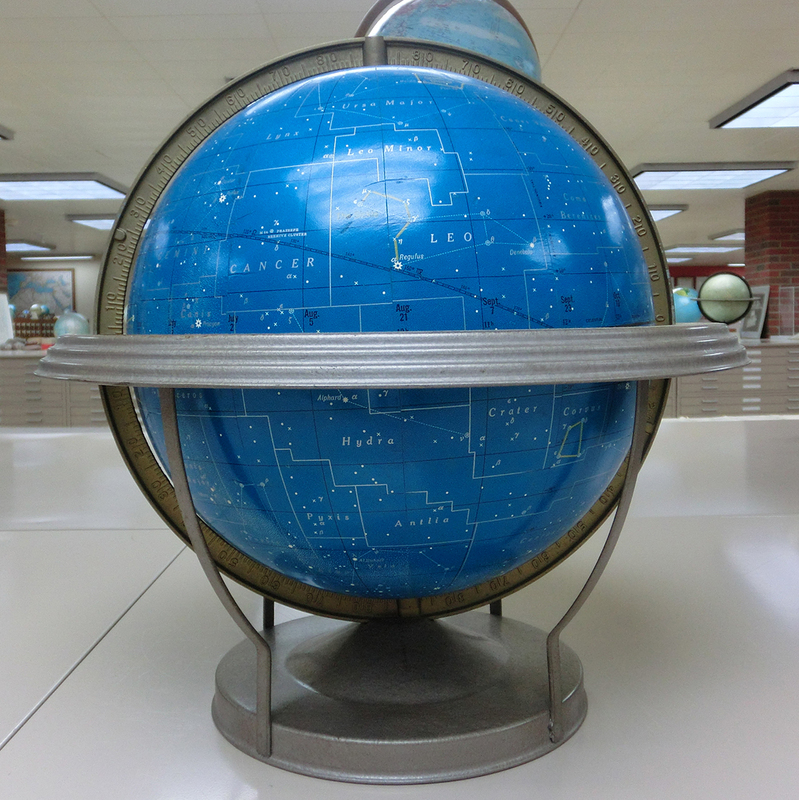 Many of the things I saw in this library, or something very similar, can be found on line, but there is no comparison of being able to see them in person, to sit in front of them and scour their details.